Being a stay at home mom is my job. I home school, and between that and my blogging, I spend a good 40 hour work week..working. Sometimes the stress levels can be higher, and some days I feel like my brain is in a fog..so I was really excited to try these 2 products. 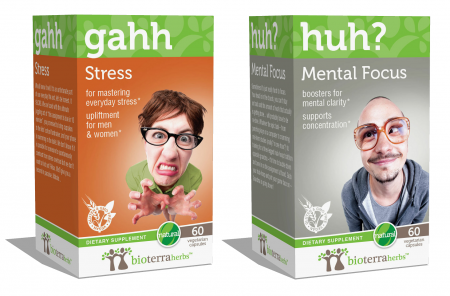 BioTerra Herbs Mental Focus....HUH?- Sometimes it’s just really hard to focus. Your head is in the clouds, you can’t stay on track and the amount of work that actually is getting done… will probably have to be re-done. Whatever the epic task – from punching keys on a computer to cramming mid-term studies (really? in one hour?) to training for a three-legged hula-hoop triathlon opposite grandma – it’s time to buckle down and zone in on the assignment at hand. Grab your hula-hoop and put your game face on – Grandma is going down! I am super happy to say that after a week of using the two different herbs, my mind is clearer on most days, and I love that I can take the stress herbs on those days when I am feeling more stressed...not so much in the summer, but back to school is fast approaching! You can purchase the Job Rescue Kit as well as individual products and the Relationship Rescue Kit here.